In 2016, an all-time high of 41.1 percent of freshman women identified themselves as liberal or far left, compared to 28.9 percent of men. The political divisions that emerged and intensified during the 2016 U.S. presidential election were particularly apparent at colleges and universities: Students protested candidates, registered to vote and debated hot-button issues inside and outside of their classrooms. 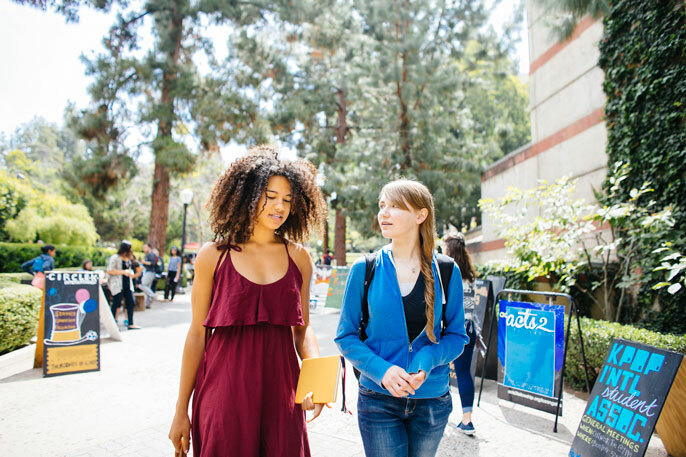 According to findings of the Freshman Survey, an annual study of first-year college students administered by UCLA’s Higher Education Research Institute, political polarization on campuses is the most extreme it has been in the study’s 51-year history. The 2016 report is based on responses from 137,456 full-time, first-year students at 184 U.S. colleges and universities. Just 42.3 percent of freshmen characterized their political orientation as middle of the road — the lowest figure since the survey began in 1966. Meanwhile, 35.5 percent considered themselves liberal or far left and 22.2 percent said their views are conservative or far right. The report also reveals the survey’s largest-ever gender gap in terms of political leanings. An all-time high 41.1 percent of women identified themselves as liberal or far left, compared to 28.9 percent of men. Women also were more likely than men to agree that addressing global climate change should be a priority of the federal government (82.4 percent versus 77.6 percent) and to favor stricter gun control laws (75.4 percent versus 58.8 percent). The survey also pointed to differences in students’ views of their own empathy for others. For example, 86.6 percent of students who called themselves left-of-center said their tolerance of people with different beliefs is “strong” or “somewhat strong,” compared 82.0 percent of centrist students and 68.1 percent of right-of-center students. The rising cost of college was a prominent theme of the 2016 election cycle, and the survey found that 55.9 percent of students had concerns about paying for college. The severity of students’ concerns about financing their college degrees varied widely by their gender and ethnicity: 65.7 percent of women said they were either somewhat or very worried about it, compared with just 34.3 percent of men. Twenty-two percent of black students and 24.7 percent of Hispanic students said they had “major” concerns about paying for college, versus just 9.2 percent of white students. 56.1 percent of first-generation students said cost was a “very important” factor, versus 45.1 percent of other students. 58.2 percent of first-generation students said financial aid offers were “very important,” versus 43.9 percent of other students. For the first time in the survey’s history, less than half (47.3 percent) of students consider their mental health to be above average relative to their peers. A record-high of 11.9 percent reported “frequently” feeling depressed in the past year, and 13.9 percent said there was a “very good chance” they would seek personal counseling in college. Also for the first time, the survey asked students how often they had felt anxious in the past year; 34.5 percent of all students said they felt that way “frequently,” while among students who have psychological disorders, the figure was 79.5 percent. 57.3 percent of Latino students said they were the first in their families to attend college, more than any other ethnic or racial group in the study. 40.9 percent of students reported using online social networks for at least six hours per week — almost 14 percentage points higher than the previous high of 27.2 percent in both 2011 and 2014. Slightly more students than in previous years reported attending colleges within 10 miles of home (13.0 percent in 2016 versus 11.3 percent in 2015). And 18.5 percent said they planned to live with their parents, compared with 15.3 percent in 2015. The 2016 study incorporated responses from first-time, full-time students at colleges and universities of varying levels of selectivity and type. The data was statistically weighted to reflect the demographic profile of the 1.5 million first-time, full-time students entering U.S. colleges in 2016. Since the study began in 1966, more than 15 million students at 1,900 colleges and universities have completed HERI surveys. The Freshman Survey is the largest and longest-running survey of American college students.